We couldn’t wait to leave Spanish Waters in Curaçao, after being anchored in the dirty water for almost two weeks and being very busy with boat projects, checking in and out procedures, the dinghy, internet problems, daily errands and a couple of days of pleasure. So, from the moment there was enough wind predicted, we left, first thing in the morning, through the narrow, unmarked entrance. The trip to pretty Santa Cruz Bay, along Curaçao’s west coast, was only about 25 miles, but we both had the urge to start early and get out of there. To avoid getting to our next anchorage too quickly, since you are technically not allowed to stop anywhere along the coast anymore after checking out (so the later you get there, the less likely you are to get into trouble), Mark and I only flew Irie’s jib and had a nice, relaxing sail to our overnight stop. Before dawn, we left for Aruba, 57 miles away, doable in a long day trip. The wind was cooperating until around 11am, when a massive squall hit us. We decided to take the mainsail down and continue just with the jib. We were still doing 5 knots, which was awesome, even though the seas were pretty big. Once we reached land, our speeds went down drastically, but we didn’t mind too much, since we planned to anchor for the night around 5pm in the hopes of nobody disturbing us. On the way to our preferred anchorage near the airport, the Aruba Coast Guard “stopped” us and sent us to the Customs and Immigration dock, where a mandatory check-in is required, even if you only spend one night to rest… Now what? We contemplated continuing on to Colombia, but that was an extra 135 miles we hadn’t counted on quite yet. We were both tired and my stomach wasn’t so happy. I prepared Irie for a stop at the dock and Mark checked in and out at the same time right before dusk. We’re not sure whether we were then supposed to leave the country again, since they normally don’t let you do both procedures at once; you ought to bring the big boat back to the dock before checking out and leaving. Anyhow, we spent one night in the airport anchorage to catch up on sleep. The following morning, it was time for a bigger trip to Cabo de la Vela in Colombia. There was barely any wind (just a little bit from the NE), way less than predicted, and the seas were massive, coming from the NW which created very confused waters around us. It was not comfortable at all and the rigging was slamming unhappily, while we were tossed around for hours. Then, the squalls hit. We rode them for a while, getting soaked a few times, but our speed increased immensely. It was good fun and exhilarating to accelerate and ride the waves. Irie hit a new record at 11.3 knots for 2 seconds! During the night, we decided to drop the mainsail, but still managed a decent speed. It was a very bumpy, wet and pukey night. Along the Colombian coast massive tankers crossed our path on this busy stretch of ocean. Our AIS receiver came in very handy! Tired, but with an accomplished feeling, we dropped anchor in Cabo de la Vela before lunch on Monday, December 5th. One more stretch to go before we’d find some peace, rest, comfort and friends in our next port of call! Cabo de la Vela has a massive “bay”, where we –and two other cruising boats – anchored out pretty far away from shore in 15 feet of water. From the moment we were settled a fast fishing boat with four Colombians came by and asked many questions (in Spanish) about our catamaran. They seemed intrigued. Later in the afternoon, more local boats passed by with families and children. They waved, stared and some women took pictures with their cell phone. It seemed to be a fun outing for them, to weave through the anchorage and check out the new boats and crews. The trip from Cabo de la Vela to Santa Marta was another 140 miles long and we started mid-morning, under engine. There was a decent amount of wind predicted, but it sure took a while before it actually filled in. After two hours of motoring – and getting worried about having to do this all day and night without enough fuel – and another two hours of bobbing along at 2 knots with the mainsail as well as the jib tied down to prevent damage, there it was…. A perfect breeze accompanied the bright sun and the relatively flat seas, now that we were moving. The rest of the sail was very pleasant and comfortable until about midnight; one of those moments when you think: “This is why we are doing this”. To top it off, a small pod of dolphins kept us company for quite a while. 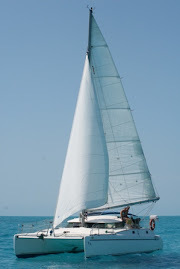 At night, main sail tied down and safely cruising along with the jib, the squalls hit again. One of them hung above Irie for four full hours dumping massive amounts of rain onto our bodies. It was foul weather gear time! Our speed diminished, until the massive dark cloud finally disappeared well before the sun came up again. The rest of the trip was rainy, with Colombia’s mountains covered in mist and clouds. We arrived in Santa Marta around 10:30am on December 7th and were greeted by two pleasant gifts: the clock was set back an hour (we love extra time in a day) and … our good friends Axel and Liz from SV Gudrun welcomed us to the marina! Time for some fun (after some well-deserved rest)! Reaching Santa Marta in Colombia.